I am on my way to Sao Paolo in Brazil to give a course. In fact, this will be the last training course for this year. Brazil is a country I have not visited before and quite frankly, what little I know of the place covers the full spectrum of stereotypes, from scantily clad carnival dancers, excellent steaks to an obscenely high crime rate. Of course there are many different ways to fly from Europe to Sao Paolo. Without a doubt though, I think I can safely say I have chosen the most elegant way to do it, with an airline that hardly needs an introduction. Location: Terminal 1, second floor, check-in counters 551 to 558. Counters: Check-in is handled by Swissport. There is one First Class counter, one Business Class counter, an internet check-in counter and five Economy Class check-in counters. I have the Singapore Airlines app on my iPhone. However, as I am not a member of their frequent flyer programme, I was unable to check-in online. The airline is quiet when I arrive. After all, this is Saturday morning. The security check is a swift but thorough affair. Just a quick word of caution for all the shopaholics out there: if you are departing from Barcelona from the non-Schengen area, I suggest you have yourself an extravaganza before you go through passport control. All there is at the D gates is a McDonalds and a fairly small duty free. Location: Behind passport control keep on walking straight ahead towards the McDonalds until you reach the lifts. Take the lift or escalator one floor down to access the lounge. Type of Lounge: Contractor lounge operated by Premium Air Lounges. Facilities: Toilets and showers are available in the lounge and in good, clean condition; workstations, a good selection of hot and cold beverages and a good selection of breakfast foods – such as yoghurts, bread, cereals. Internet: Complimentary wifi provided by the airport, but you need to register. The lounge is rather nice and fairly quiet this morning. It is still rather early, and the few people in the lounge that are travelling together are talking in a subdued hush. With the warm light, wood floors and leather sofas there is something very cosy about the lounge. I help myself to some breakfast and then decide to give my mum a call before I set out on my next journey. I reach the gate just after 08h30, the boarding time indicated on my boarding pass, just as an announcement is made informing us that due to the very strong winds on the ground in Barcelona, loading the aircraft is taking longer than anticipated. As a result, our departure is delayed by about 45 minutes. Seat: 11A, window on the port side of the vessel. Singapore Airlines operates the B 777-300ER in two configurations with three or four different cabin classes. 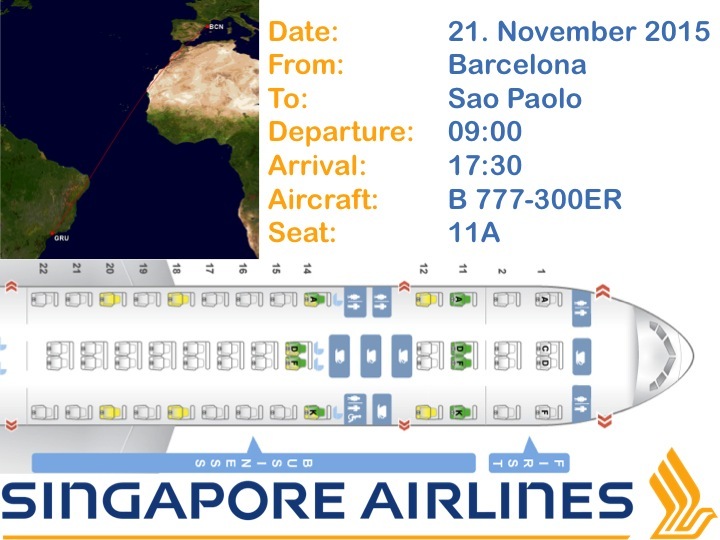 On the route to Sao Paolo, the three-class configuration is used with a First, Business and Economy Class. There are 48 seats in total in Business Class. The first two rows are ahead of the L2 galley, with the remaining ten rows aft of the L2 galley. Row 11 is the first row of Business Class. The Singapore Airlines seat is definitely very wide and offers a lot of privacy for a Business Class seat. Even so, I cannot really say that I like this seat. First of all, it is not possible to convert the seat into a bed while sitting in it. This is because the back of the seat needs to be folded forward to turn it into a bed. Furthermore, to be able to fully stretch, you need to lie in the seat at an angle. Obviously this should not really matter, but I think many people will have a tendency, when lying, to want to align themselves with the aisle or the cabin wall of the aircraft. I flew Singapore Airlines from Zürich to Brunei and back about two years ago and to be honest, on both of the long-haul flights I ended up with a back ache. The upholstery is covered in leather or some other material intended to look and feel like leather, which inevitably makes you sweat after a while. Admittedly though, the seat and cabin do look rather nice. The service is excellent. The crew are friendly and very attentive. The Singapore Girl has often been accused of being slightly robotic in her behaviour, but is hardly the case with this crew. As soon as I reach my seat, one of the flight attendants comes to take my jacket, while another inquires if I would like a English or Spanish speaking newspaper. Singapore Airlines does not offer vanity kits in Business Class, which does not bother me seeing as I usually end up leaving them on the plane anyway. However, they will distribute eyeshades, socks and slippers. Dental and shaving kits are available in the lavatories. Ear plugs are available on request. Towel before the meal: Cold, lightly scented towel. Selection of sliced fresh fruit. Bircher Müsli with rolled oats soaked in milk, natural yoghurt, dried fruits and nuts. Cheese Frittata with pan fried veal sausage, sautéed mushrooms and potatoes. Selection from the breadbasket with preserves or olive oil. The meal hits the spot nicely. Even though I did have something to eat in the lounge, I was starting to feel hungry. I think I like the Bircher Müsli most, it has a nice, rich, creamy texture and is full of flavour. Once the service is completed, the crew pass through the cabin regularly, asking passengers if there is anything they need. I barely last one hour after the brunch service is over, before I start to feel peckish again and order a bowl of vegetarian noodles with lettuce, black mushroom and chilli sauce. Outside, the vastness of Africa spreads out beneath us. An apple, four packets of nuts and three packets of speculatius biscuits later and it is time for the second service to begin. By this time we are just two hours and thirty minutes out of Sao Paolo. Hot towel before the meal: Yes, lightly scented. Choice: There are four choices for the main course – beef, chicken, fish or lamb. Lamb and chicken satay with spicy peanut sauce, cucumber and onion. A platter of Iberico ham, cured pork loin, chorizo sausage, mixed salad and balsamic dressing. Seared Tournedos of beef with baby zucchini, crushed potato with garlic, vine cherry and thyme jus. Selection of cheese with garnishes – cured sheep cheeses, Viejo Maestro, Valdeon. Much to my surprise and delight, the second service is another full meal. To be honest I do not particularly like the starter, there is just a bit too much meat on it for my liking. But apart from that, all the dishes taste very good and especially the mashed potato is creamy and has a very strong taste of garlic. Eventually we land just a few minutes ahead of schedule, despite our delay departing from Barcelona. The nice thing about the Singapore Airlines flight is that it arrives long after most of the other European flights. We taxi in right behind the Springbok from Johannesburg, but even so, immigration is fairly quick. This entry was posted in Boeing B 777-300, Business Class, Singapore Airlines and tagged airlines, aviation, Business Class, business class passengers, business class seat, departure gates, flying, singapore airlines, singapore airlines business class, singapore airlines business class review, singapore airlines business class trip report, singapore airlines trip report, singapore airlines trip review, transportation, travel, trip report. Bookmark the permalink.